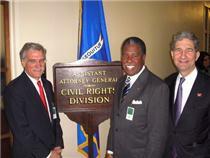 Pictured left to right are Dr. Robert Groves, census director, Dr. Bernie Miller, African American Census advisory chairman, and Attorney Cameron F. Kerry, General Counsel Department of Commerce. Dr. Bernie Miller, pastor of New Covenant Fellowship Church and chairman of the U.S. Census Bureau’s African American Advisory committee, was one of a handful of selected leaders invited to a special meeting at the Department of Justice in Washington, D.C. on Thursday. “We were told, emphatically, that stated provisions of the Patriot Act pertaining to information-gathering and sharing do not override federal confidentiality laws when it comes to the U.S. Census questionnaire. Some people question folks with a clipboard and a badge. This strong statement released to us today will, hopefully, convince the minority communities that the information given on the questionnaires are safe and secure,” Dr. Miller said. Assistant Attorney General Ronald H. Weich said, "The long history of congressional enactments protecting [Census] information from such disclosure, as well as the established precedents of the courts and this department, supports the view that if Congress intended to override these protections, it would say so clearly and explicitly." In this case, federal Census laws trump the Patriot Act, and the agency will keep information obtained during the headcount confidential and away from other departments, Mr. Weich said.